The “Avengers: Age of Ultron” teaser trailer leaked today, before next Tuesday’s scheduled release. Rather than fight, Marvel first blamed Hydra, and then embraced the leak and offered the full resolution edition of the trailer. It appears that they are not going to go for the overly complicated story that they did in the comic book. It is probably a minor variation, but it does look interesting. Also, it looks as if they might be cutting out Hank Pym, so I guess no Ant Man. No, he’s being saved for his own flick. I think they’re trying to simplify it and roll Hank into Stark’s character. And I think it’ll work. Tony’s already conflicted about his creations and this will just push his character a little more. I wasn’t sure about casting Spader (or Spader’s voice) as Ultron. I was wrong. He sounds great. “I’ve got no strings…” Shades of HAL/GlaDOS right there. It surely will be a triumph, I’ll make a note of this, it will be a huge success. 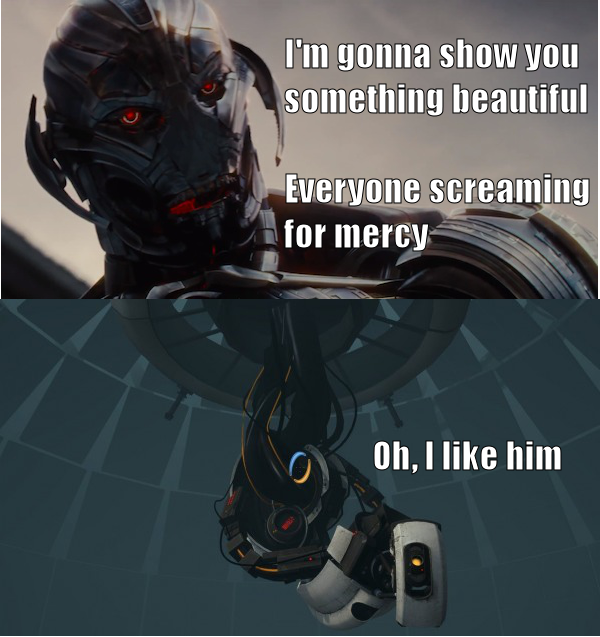 I need to make a meme with Ulton, a quote from the trailer, and a pic of GlaDOS underneath that says “Oh, I like this guy”. Did GlaDOS say that sometime? I don’t recall… She actually did say “Oh, I like this guy” about Cave Johnson when he was talking about burning people’s houses down with lemons rather than making lemonade. You win the Internet today Fez. Take your victory lap. They appear to be going for darkness here, which fits the middle of a film trilogy. Yeah, it definitely has a very “Empire Strikes Back” feel to it IMHO. I have to say my brain is all over the place after this trailer. My comic book tastes weren’t exactly mainstream so I never really read Avengers, X-Men, etc. and my knowledge is very spotty. I figure the plot is going to be something along the lines of Ultron is a new/evil version of J.A.R.V.I.S. which ends up in an Iron Man drone suit thus making Tony Stark the creator of Ultron (instead of ?Hank Pym?) and giving the other members of the team a reason to be angry with him. That being said, would others speculate that the events of this movie (the angry protestors, Thor choking Stark, Stark lamenting the “path I started us on”, Cap’s broken Shield) will probably lead to an Avengers 3 which follows the Civil War story arc? Does the fact that he drops Mjölnir mean Thor is unworthy? Does the Hulkbuster armor, depressed Bruce Banner, and tender Black Widow finger touch mean a potential Planet Hulk movie? Could the ballerinas be a set up for the Black Widow stand alone movie? IS ANDY SERKIS ACTUALLY HOWARD THE DUCK’S ALTER EGO?!? !